Fans of the NFL know that Draft Day is a huge moment and can decide the fate of their favorite team. For example, when the Indianapolis Colts had the number one draft pick in 2012, they chose QB Andrew Luck. He was a much hyped quarterback out of Stanford, but no one expected him to skyrocket into being one of the best QBs in the NFL so quickly. Last season, he finished 7th overall in QB Rating behind some pretty impressive company, including Tony Romo, Aaron Rodgers, Drew Brees, and Tom Brady. He also led the Colts to a AFC South title, the playoffs, and went as far as the Conference Championship, where they lost to eventual Super Bowl Champs, the New England Patriots. Not bad for a 25 year old. The draft has importance in every sport, although it’s true that the NFL does make their draft the biggest deal. The NBA draft is also a big event, and because there’s not really any competing league with the NBA, the best of the best are the only ones drafted, and usually, there’s a bigger correlation between success in college and success in the NBA than there is in college to NFL football. This makes basketball fans much more excited about their drafts; they often have a better idea of just how much it will impact their favorite teams. For those trying to build a fantasy league, for example, this is a huge piece of knowledge. It also gives people a bigger reason to take interest in college sports; if they know that they might be watching the next Michael Jordan or LeBron James, the college games are much more exciting to watch. Baseball and Hockey are much different. The drafts are still important, but they don’t receive the same amount of hype. This is because gauging talent is a lot harder, and sometimes number one picks end up being complete duds. A Bryce Harper (2010 #1 pick) is far less likely to be drafted than a Delmon Young (2003 #1 pick). However, in MLB especially, statistics have gotten much better at analyzing talent. That’s a good piece of knowledge to keep in mind when drafting your fantasy teams. Mark Appel, the #1 pick of 2013 for the Houston Astros, might just be a top performer in two or three seasons. Brady Aiken (2014 #1 pick) was also picked up by the Astros, which is a promising thing for the Astros. It gives them a good chance of turning around their fortunes and getting out of the bottom of the American League. 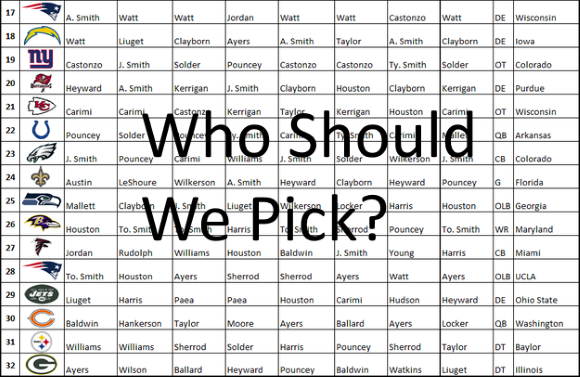 If you are a sports fan, and a fan of a particular team, it’s always fun to see where your team’s picks lie, and trying to guess who they will pick. The number one pick is always a little easier to predict than the number two or three pick. If your team doesn’t have a first round pick, you might think that their picks don’t matter, but remember the case of Tom Brady. He was picked up by New England in the 6th round of the 2000 draft. Now, he’s an All Star and a multi Super Bowl champion and MVP. He was the 199th overall pick in that draft. If your sport doesn’t have a draft, such as with NASCAR or MMA fighting, there’s no need to worry. There are always other behind the scene activities going on. These include contract signings, sponsorships, and many other things. These all carry a certain element of excitement with them. You can always start following a new sport, too, if you are interested in this.